Nothing wrong with consistency when you order a steak medium-rare, or buy hair coloring in a box, or order a dozen of anything from the Internet. The kind of consistency Emerson refers to is the soul-crushing, tedious, bureaucratic consistency that brings the comfort of routine to the “but we’ve always done it this way!” crowd. No one wants surprises when they order a Quarter Pounder with fries. Wikipedia contributors, “Nacre,” Wikipedia, The Free Encyclopedia,http://en.wikipedia.org/w/index.php?title=Nacre&oldid=587914960 (accessed January 3, 2014). Well, the caviar – and it’s a darned good thing – about made up for it. 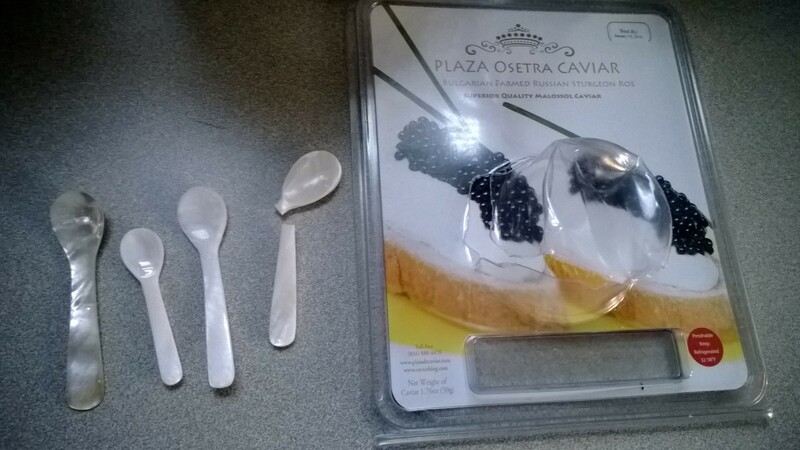 And when I jokingly told my husband, on New Year’s Day, that I was going to go give those caviar people a piece of my mind on Twitter or something, I ended up finding a blog fit to drool over and it almost made me forget all about the silly spoons. Almost. 😉 Check out caviarblog.com – you’ll want caviar for breakfast, lunch, and dinner! Oh, who the heck needs a spoon? As they say on the blog, the best way to taste caviar is straight from your hand. Works for me. ← Previous Previous post: Am I Up to the Challenge? You make me want to go scarf some fish eggs. If I do, I’ll order them from Russ & Daughters in NYC. Why? Because, that’s why. One of my favorite classes in culinary school was Culinary Survey. It was essentially two weeks about the history and breadth of food production. The worst night was cheese, 32 cheeses from softest to hardest and we had to taste each one. Sure, it sounds great at first blush, but just try eating 32 separate cheeses in an hour. The second worst night was caviar. I hate fish and the offspring of fish still tastes like fish. I’ve never tried it. But I do like the spoons!